Visitors to Zion National Park can expect crowded conditions, long lines and few places to park. | nickrlake/Getty Images. SPRINGDALE — Visitors to Zion National Park can expect crowds, long lines and few spots for parking this Memorial Day weekend. The holiday has historically been the park’s busiest weekend of the year. 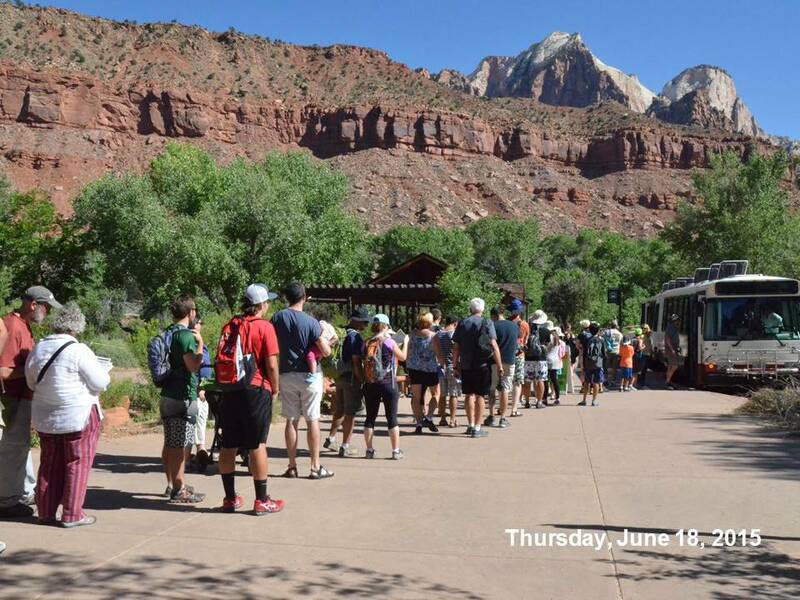 Over 71,000 people visited Zion during the 2015 Memorial Day weekend. Last year Zion saw its highest-ever visitation numbers and so far 2016 is on pace to set a new record, Zion National Park Spokesperson Aly Baltrus said, adding visitation is up 8 percent from 2015. Despite keeping facilities open longer and increasing the number of staff working during the holiday weekend, visitors can expect crowded conditions. Since parking typically fills quickly, Zion officials advise visitors arrive either before 9 a.m. or after 2 p.m., park in Springdale and utilize the free shuttle buses to access the park. Shuttles will be operating at full capacity, at four to five minute intervals throughout much of the day. Both the Visitor Center information desk and wilderness permits desk will have extended hours, remaining open until 7 p.m. The Zion Nature Center will be open Saturday and will remain open through Labor Day. Hours will be from 1 p.m. until 5 p.m.
Park Superintendent Jeff Bradybaugh said visitors should arrive prepared not only for crowded conditions, but also for hikes and any other activities they have planned. During 2015, park search and rescue incidents increased by 30 percent. Arrive before 9 a.m. or after 2 p.m.
best advice. pick a different date. Place goes over capacity and it’s disneyland from hell.